One of the joys of reading for me is having the opportunity to slip into another world where I can give in to being transported to a different time and place. As I've mentioned before, I love books that take readers on a journey towards the unknown and unexplained. Stories that have a gothic feeling to them are always an extra treat for me as a booklover. The new gothic romance novel, The Rose Within, by debut novelist Sana Pirzada, is a wonderfully thrilling story of love in many forms. The story makes one think of classic gothic works such as The Phantom of the Opera or Rebecca. The Rose Within is an intriguing novel full of passion and mystery that kept me enthralled until the very end. 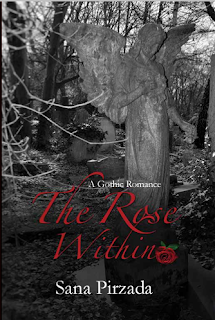 The Rose Within is set in 1920s England, and tells the story of Jonathan Malcolm as he is drawn into the world of Winter Grange House and its inhabitants. At this grand house Jonathan meets the love of his life, Selina Selwyn. She captures his heart immediately. There are many barriers between them due to a cloud of mystery that surrounds Selina and her ancestral home. There are rumours that Winter Grange is haunted by ghosts and has its share of supernatural happenings. Jonathan experiences many trials that threaten to thwart his pursuit of the beautiful Selina. Throughout the novel, readers are left wondering if he will ultimately be with his true love or will love be denied in the end. I found Jonathan to be an interesting character. He starts off as a young man who is simply trying to make his way in the world and through chance he is set on a path of amazing discovery. As I mentioned earlier, for me, this is a story of love in many forms. The main story is about Jonathan's quest for the lovely Selina, however there are also examples of love between others. Without giving away too much, I'll just say that I liked the connections between the inhabitants of Winter Grange House. All is not as it seems. There are so many things that I adored about this novel. The story itself had a really good pace to it and made me as a reader want to keep going in order to find out the secrets that were held within the walls of stately Winter Grange House. I also really enjoyed the gothic vibe of the work as a whole. This made for a great atmosphere as the story unfolded page by page. Sana Pirzada is an excellent storyteller. She does a beautiful job of weaving various strands together that both startle and thrill readers in equal measure. The Rose Within is a wonderfully-written love story that expertly veers away from the standard love story onto a path towards the unique and intriguing. I loved this book! To find out more about The Rose Within, please visit Sana's Facebook page here. The novel will be available on 25th April.